This personal Kanbanfor1 board revolutionises your todo list and provides you with an elegantly simple way to interact with your task list. In one quick glance you can see what you have to do today, what you should work on next, what you are working on right now and what you have achieved. The physical act of moving sticky notes from one column to the next throughout your day will put you in touch with your progress and make managing your daily workflow a tactile pleasure. Derive an unparalleled sense of satisfaction from seeing the sticky notes lined up in the DONE column at the end of your day or week. 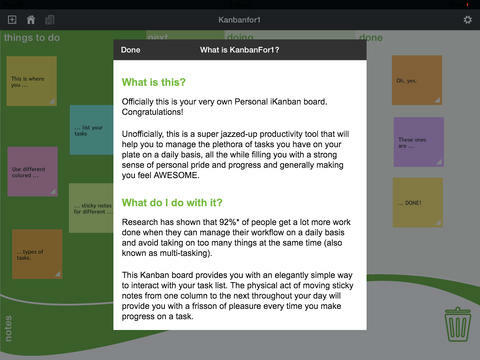 The Kanbanfor1 board helps you to manage a continuous flow of things to do.